Cromargan 18/10 Stainless Steel, which resistance to acid, and ability to remain unbroken means that it forms one of the most durable products out there. Interchangeable Locking Lid, that, although is secure enough to ensure peace of mind when cooking, can also be removed easily to allow the pans and pan lids to be put straight into the dishwasher. Colored Pressure Indicator, this indicator doesn't only give out a visual representation of the pressure contained within the cooker, but also gives out an audible beep. From the kitchen suppliers with expert foresight and a rare insight into essential items, instead of those everyday so-called 'utensils' that just sit at the bottom of my drawers gathering dust, WMF have once again created an excellent and practical product, guaranteed to become a household favorite all across the globe. The WMF Perfect Plus set (see lowest price), forged from Cromargan 18/10 Stainless Steel (a safe steel that is rust-proof, acid resistant, durable and easy to clean), is superior to any other pan set I have ever come across before. Now gone are the days of putting ill-fitting lids over the lip of the pan and praying that you won't accidentally push it off and let all of the heat escape as a result of dancing around the kitchen with a precariously balanced dinner plate. 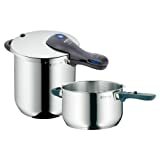 The WMF Perfect Plus rectifies this problem in two different ways: firstly, the lid locks into place so there is no more shifting, that would otherwise cause your soup to splash out onto the work surface, and secondly, both pans are the same diameter, so both can sit side by side on the hob without one pan getting less heat than the other. And just in case this wasn't enough, not only are the pan handles ergonomic and become further strengthened by heat (phenolic), they also have an in-built alarm system which is activated when the interchangeable locking lid is locked into place, meaning that you are immediately notified if even the slightest mishap were to occur to your carefully prepared family meal. The pans of the WMF Perfect Plus, in addition, are also completely dishwasher safe when isolated from the lid handle (which is easily removed), providing you with the vital extra ten minutes to make a cup of tea before the kids come home. During cooking, the TransTherm pan base ensures that heat is distributed evenly throughout, making it ideal for cooking hearty meals, such as Beef Casserole and the automatic pressure sensor built into the lid, ensures that every meal comes out 'just right'. The first time using the WMF Perfect Plus (best price), I found it to be not only fast and healthy, but also a safe product that retained all of my food's delicious aromas, which it still does time after time. The bayonet lock works seamlessly with the sealing ring (which is indicated by the audible click when the lid handle has slid and locked into place) to provide the airtight internal environment that means that the correct pressure is maintained until I either manually release the built-up pressure (in the form of steam) or, if I am otherwise occupied, the lid gasket pops out from the side releasing the excess for me unless I wish to only turn off the heat and allow the even heat distribution of the pressure cooker to enable the meal to simmer. The lid also has a coloured indicator, which rings correlate to the type of food inside the pressure cooker e.g. the first orange ring is used to monitor the pressure inside the cooker for meals that consist only of delicate vegetables, poultry and fish whereas the second orange ring displays when meat and other robust foods (which I have found also include things like rice) are cooked. 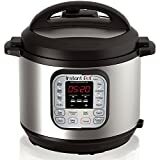 As the lack of oxygen is important for sustaining vitamins, nutrients and minerals within food, I have found pressure cooking to be an excellent way of ensuring that my family all eat healthily. However, the benefits of the WMF Perfect Plus are not only limited to the scrumptious yet healthy food that comes out of it, but also the economic impact long-term as the Perfect Plus uses 50% of the energy to cook the same meal, otherwise cooked using a different method, while only needing 70% of the cooking time. In conclusion, if you find yourself pushed for time, vying for that healthy lifestyle that you find never seems to fit in with your hectic schedule and a laid-back method of cooking, then look no further than the WMF Perfect Plus, you'll be glad you did and you'll discover just how it can boast to be 'Perfect'. Will this last you for years to come? Definitely! Will you be satisfied by the result? Absolutely! Will your whole family enjoy their meals? For certain! I've found that the kids even eat more vegetables! The WMF Perfect Plus is a pressure cooker that demands to be used every day. It is built with extremely superior materials, and we’ve found this enhances the overall cooking process. With high operating temperatures, you’ll be able to cook delicious food on the fly.